Six Twenty Seven: Natural Hair: Style Ideas "Senegalese Twists"
** Update: Since writing this post last year, I actually got Senegalese Twists in Chicago a few months ago and shared with my blog pictures and my experience! For anyone in the Chicago-area interested in getting Senegalese Twists please give Nana a call. She was amazing. Let her know that Ishea sent you. 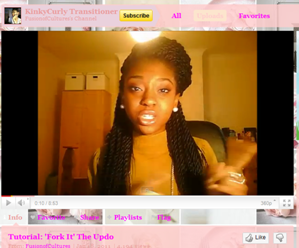 I came across YouTuber FusionOfCultures a few days ago and instantly fell in love with her Senegalese Twists. I'm a little tired of doing my hair and was thinking about the options I had for getting it out of my way. I haven't rocked braids in YEARS and I've never had twists, so I ran this style by my husband (the best sounding board) and he wasn't feeling it. Although I was on the fence about getting them, his "nay" vote pretty much clinched my decision to pass on them. There's no way I'm paying $ to rock a style my husband loathes. Still, these were the BEST Senegalese Twists I've seen thus far and I definitely wanted to share them with everyone. In the meantime I'm on the hunt for a style to rock throughout Spring and into Summer. Any ideas?